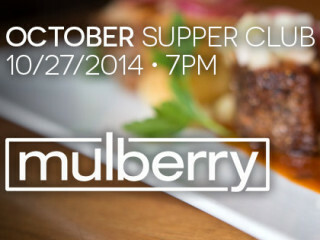 Who's ready for another autumn-inspired dinner from Mulberry? Chefs Kristine Kittrell and Ruston Richardson are preparing a three-course meal complete with wine pairings, including venison carpaccio, green tea brined duck breast, gnocchi sweet potato purée and more. RSVP to the dinner and purchase your tickets here.